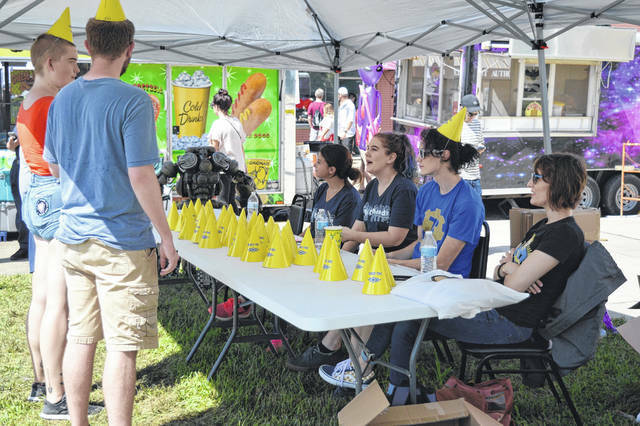 Bethesda Game Studios representatives interact with Mothman Festival visitors. One young woman poses with Fallout’s Vault Boy, mascot of the Vault-Tech corporation in the Fallout gaming universe. 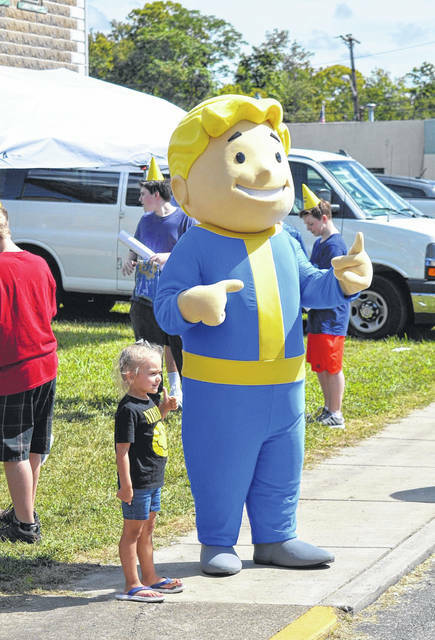 POINT PLEASANT, W.Va. — Visitors to the Mothman Festival and fans alike were able to snag themselves a photo with the Fallout gaming franchise’s Vault Boy and trade news with representatives from internationally-recognized Bethesda Game Studios over the weekend. The next title in the video game franchise Fallout, dubbed Fallout 76, will be set in a post-apocalyptic West Virginia and Mason County’s Mothman legend will be reportedly making appearances in the game. The game is slated for release November 14 this year. Fallout is a game series which has garnered world fame after its first inception in 1997. When the Mothman Museum caught wind that its favorite legend would be featured in the game, it reached out to Bethesda Game Studios and asked them to participate in the Mothman Festival. Crytozoology is the study of creatures characterized in folklore. Cryptids are the creatures cryptozoology seeks to study and identify. Bigfoot and the Loch Ness Monster are often regarded as cryptids. Finster said she wasn’t certain if it was because of the 2002 “The Mothman Prophecies” movie, based on the 1975 book by John Keel, or because the Mothman was popular in cryptozoology, but that she couldn’t number the amount of fans that weren’t from West Virginia she had seen who were “super psyched” to hear that Mothman would be in the game. Another confirmed cryptid to be featured in the game includes the Flatwoods Monster. According to Bethesda Community Manager Abigail Tyson, a “much scarier” version of the Mothman Museum will be featured in the game. Finster and Tyson said one of their favorite questions came from a young boy who asked what their favorite ice cream flavors were. Both Bethesda representatives said the Fallout 76 map would be four times the size of previous title Fallout 4’s map. The game will have both live events and traditional quest lines. Fallout 76 differs from other games in the series as it will be featured online but will still be considered an action role-playing game. The Fallout game series has traditionally been set as a post-apocalyptic story in various locations throughout the U.S. As an action roleplaying video game, much of Fallout’s story has been based in the post-World War II culture of the 1950s, making multiple thematic references to the potentials and dangers of nuclear technology. Mutated monsters and radioactivity are just among a few of the hazards players encounter as they journey through Fallout’s previous game titles. Mothman sightings were reported in area newspapers between 1966 and 1967 in Point Pleasant as well as around Cheshire in Gallia County. Much of Mothman folklore is connected with the Silver Bridge collapse of December 1967. Fallout 76 is anticipated to make appearances on PC, XBox One and PlayStation 4.